The Christian Democratic Union (CDU) has ruled Germany since 2005 and for 49 of the past 69 years—its election of a new party leader December 7 will have far-reaching impact and mark a new era. Angela Merkel, under fire after disappointing state election results, is attempting a managed retreat, sacrificing her party chairmanship to preserve her position as chancellor and avoid losing power completely. Nevertheless, the end of her rule is in sight; at the latest she will depart in 2021 when this legislative term ends, but the next CDU leader may seize the reins of government from her hands even sooner. 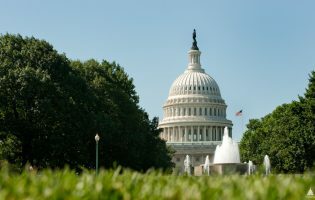 The succession will affect the Trump administration’s ability to work with Europe’s leading power on many of the world’s thorniest problems, such as Russia’s aggression toward Ukraine and its undermining of international security, the challenges of China’s economic model, and addressing transatlantic defense and European burdensharing. A new CDU chief will face gaping holes in European leadership: Theresa May’s British government is absorbed by tumultuous Brexit politics; French president Emmanuel Macron offers to lead but finds none ready to follow; and Italy is absent internationally under a left-right populist government. The result is that Germany has the greatest potential to shape Europe’s future and the transatlantic relationship. Washington can capitalize on this situation only if it recognizes that the U.S. can achieve more with allies than it can alone and develops a sober readiness to prioritize areas of cooperation and ratchet back the counterproductive economic and political pressure on some of its closest partners. Germany has the greatest potential to shape Europe’s future and the transatlantic relationship. The CDU leadership election offers clear differences in style and experience: Annegret Kramp-Karrenbauer’s centrist competence suggests a continuation of many of Angela Merkel’s policies and she has broad public appeal, but she has little international experience; Friedrich Merz evokes a more conservative CDU that appeals to many traditionalists, and he is well known in the U.S. through his leadership of the transatlantic “Atlantik-Brücke” organization. He has been out of politics for nearly a decade, which represents detachment for some but the possibility of renewal for others. 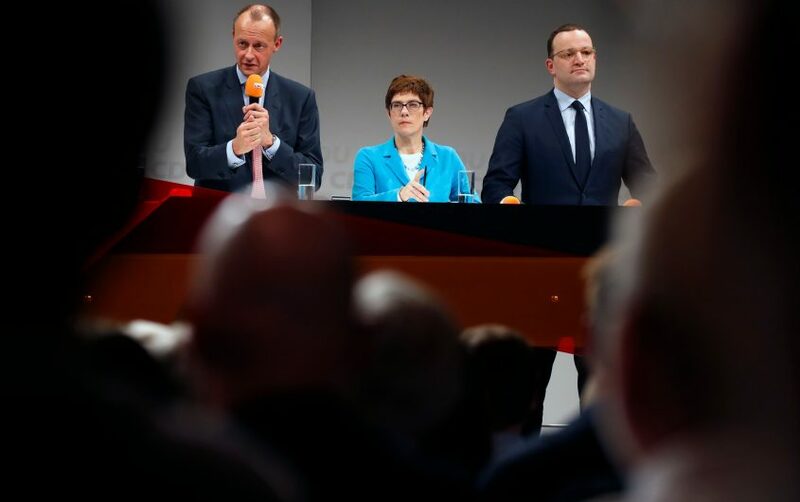 The third contender faces long odds, but Jens Spahn, not yet 40, melds an ambitious brand of conservatism with a focus on future-oriented policies for a younger generation and has established himself firmly. In foreign policy, all three would be likely to hew to the CDU’s tradition of Atlanticism and to stress multinational approaches, which are Germany’s instinctive way of dealing with its uncomfortably large size and might that would otherwise dominate Europe. It is ironic that Germany, with steady (albeit modest) growth, a hefty budget surplus, and an enviable public administration, is convulsed by a need for political change. The German party landscape is shifting dramatically, with uncertain consequences that will constrain the next CDU leader. Germany’s center-left has undergone a revolution, with the Social Democratic Party (SPD) falling to a record low of 15 percent in opinion polls. In its place, a self-confident Green party has become the country’s second-most popular political force, a change that if it persists would disrupt the old coalition models and could prove more significant than the rise of the far-right Alternative for Germany (AfD) that now hovers at around 15 percent. If an election were held today, the only two-party coalition with a viable majority would be the CDU and the Greens. The question for Germany’s relationship with the United States is whether the change in CDU leadership will be accompanied by a desperately needed fresh look at its foreign policy. The question for Germany’s relationship with the United States is whether the change in CDU leadership will be accompanied by a desperately needed fresh look at its foreign policy. The international system on which Germany depends is deteriorating in four dimensions: global challenges such as China’s growing might and Russia’s unchained assertiveness; transatlantic trade, energy, and defense frictions; the inability of the European Union to agree on its future direction; and the growing domestic influence of extreme parties, especially the far-right. Berlin has spent more time mourning these trends than developing new approaches. A renewed creativity in German foreign policy is needed to prioritize and lead in addressing these problems. Public opinion in some cases may be farther along than the political elite gives it credit for: a recent poll shows that a plurality of Germans favors increasing defense spending, for example. 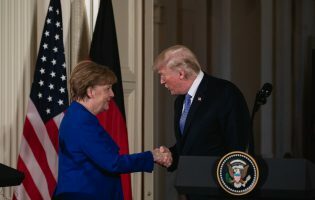 At the same time, however, a majority supports greater restraint in Germany’s approach to international crises and a plurality believes Germany should cooperate less with the United States rather than more. Whether Germany’s leadership can operationalize the receptiveness toward stronger defense while managing the skepticism toward international engagement will determine the scope for stronger cooperation. 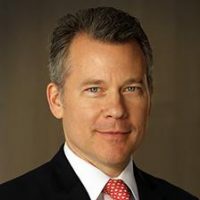 The United States, which needs strong partners in Europe to accomplish its international objectives, has a deep interest in the success of the new leader of Germany’s strongest party.